Austria’s very own Adread Diwald of CrossFit Salzburg gives us an insight into what exactly goes on in his BOX. I was introduced to CrossFit by a teammate (Thanks Chris, you changed my life) during my active American Football Career back in 2009. We were at Training Camp that day when I looked up the Mainpage, skipped lunch and went straight to a local Globo Gym for the WOD instead. I got “sacked” by “CINDY” and fell in love with CrossFit immediately. We wanted to spread the word of CrossFit in Salzburg and ran out of space in my garage gym pretty quick. Well I don’t think a CrossFit Box must standout from others. If there is CrossFit in it it will make you change for the better and that’s what affiliates should strive for. We definitely live that “Commitment to Excellence” inside and outside the gym. We are now at 120 members (11/2013), pretty well balanced female and male. Our Youngster athlete aged 11 whereas our Master athlete turns 78 this year. We do have competitive athletes, that compete in local and international competitions such as the Battle of London or Italian Throwdown. We do not have a Regionals athlete yet, still working on that. Yes we offer Yoga, Flexibility and Gymnastics Classes. Also we do run a kids Program. We do Paleo Challenges 3 times a year and offer private nutrition consulting. 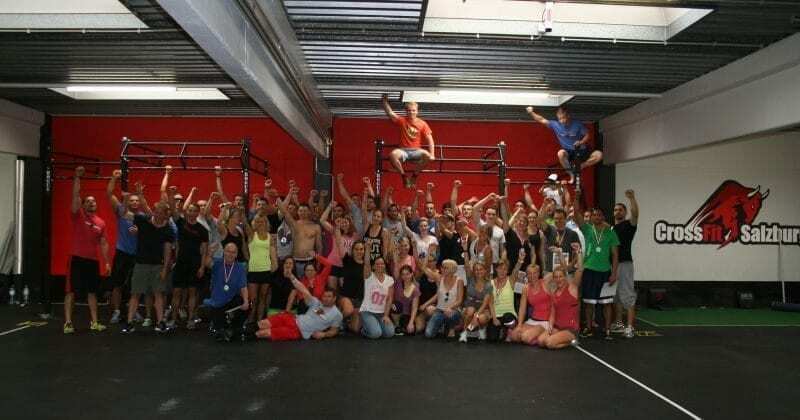 Yes, we host open Competitions aka “CHAMPIONS DAYS” at CrossFit Salzburg. 60 athletes get invited to prove their Fitness in 2 Categories. An rx Cat. “Competition” and a scaled Cat. “Fitness”, as well as Masters 50+. In 2014 we are moving in a bigger location the“Salzburg Convention Center” to invite 120 Athletes to prove their Fitness in “CHAMPIONS DAY SALZBURG 2014”, a two day event with online qualification. We are pretty excited about it already. Yes we are close with our Austrian Boxes of course and do have friends internationally at CrossFit Kingspoint, Florida or CrossFit Mallorca in Spain to name a few.